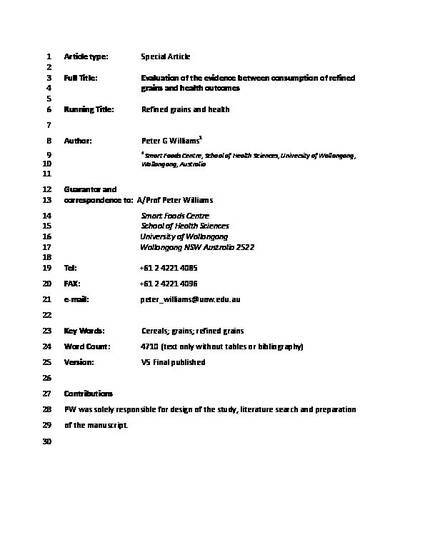 Williams, PG, Evaluation of the evidence between consumption of refined grains and health outcomes, Nutrition Reviews, 20(2), 2012, 80-99. This review evaluates the available evidence on the relationship between consumption of refined grains and health outcomes. A total of 135 relevant articles were identified from database searches of studies published between 2000 and 2010. The great majority found no associations between the intake of refined grain foods and cardiovascular disease, diabetes, weight gain or overall mortality. A few studies found that very high intakes might be associated with some types of cancers, but at moderate levels of consumption the risks were not significant. The totality of evidence shows that consumption of up to 50% of all grain foods as refined grain foods (without high levels of added fat, sugar or sodium) is not associated with any increased disease risk. Nonetheless, eating more wholegrain foods remains an important health recommendation, and most consumers will need to reduce their current refined grain consumption to no more than one-third to one-half of all grains in order to meet the targets for wholegrain foods.